The concept of a dining experience based on Fawlty Towers was hard for me to get my head round, especially when I found out that it was an Australian event. All I could picture was that loveable, typically British hotel in Torquay which was continually full of complete imbeciles. I had visions of Basil Fawlty failing to mount a moose head on the wall, Sybil shouting at the top of her voice, and Manuel running round like a lunatic. The more I thought about it, however, the more I laughed to myself, and the more I loved the idea of having a meal with these characters. Held on the R.S. Hispaniola on Victoria Embankment, ‘Faulty Towers The Dining Experience’ is a site-specific, interactive comedy that is performed in a restaurant. The audience are the diners and the cast are their useless but ever amusing waiters. The evening offered two hours of Fawlty Towers fun and a three-course meal. Unfortunately, the £44 price tag failed to include drinks, which was a shame, especially as an event drinks menu was offered, possibly ensuring a price hike on the usual Hispaniola beverages. I also couldn’t quite put my finger on why it took part on a boat, considering the original show is based in a hotel, but perhaps I was letting my bad sea legs get in the way. After one glass of wine I felt like I’d had the whole bottle! Despite this, the evening was most enjoyable and offered a different type of entertainment to an audience of British comedy lovers (although I was clearly the youngest there!). In true Fawlty Towers style, the night was full of mishaps, rudeness and, ultimately, laughter. It was a mish-mash of classic jokes and witty dining room antics, taking Fawlty Towers fans back to the good old days; so much so that they all interacted with the show. This interaction was amusing at the beginning but it got a little tiresome towards the end. I couldn’t help but feel that there were a few people planted in the audience too – a certain German gentleman spoke up on a number of occasions, which spurred Basil on to do his famous walk through the restaurant. It certainly got the response it expected though as the whole audience were in fits of laughter, trying their hardest not to spit out their dinner and wine through the hysterics. We also saw Basil stealing food from tables to give to other diners, Manuel garnishing the table cloth instead of the soup and Sybil sounding the alarm bells when a rodent went missing in the restaurant. Even the table places were part of the joke; I had two forks, my friend had two knives. Although the entertainment was top notch, sadly the meal wasn’t. The main course of chicken and vegetables should’ve been simple yet it tried to be too fancy and minimalistic. The chicken was dry and was missing the main ingredient – mushroom sauce - although I’m not sure if this was on purpose or not! 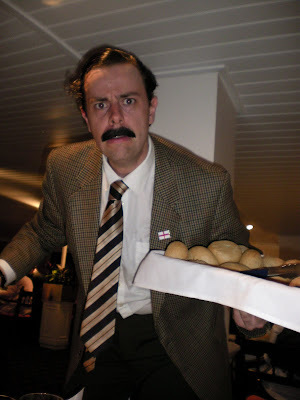 Overall, the whole night paid excellent homage to Fawlty Towers, and John Cleese would’ve been hard pushed to find a better stand in for Basil. His mannerisms reflected Cleese to a T. Manuel and Sybil were also played fantastically and the chemistry and comedy timing between the three of them was second to none. I can certainly see why this show has been a sell out in other countries, and why the show will be back for an entire month next year (same venue).